It is a kind of chronic dermatitis. In this condition a red coin-shaped rash appears on the skin on different parts of the body like forearms, lower legs, feet, hands, trunk, etc. but not on the scalp or face. These round plaques consist of many tiny red spots and have a well-defined edge. Their size can vary from some millimeters up to a few centimeters. The condition is also known as nummular eczema or dermatitis or discoid dermatitis. The term nummular came from the Latin word nummus which means coin; since this is a coin-shaped rash, therefore, it has been named so. The condition is extremely uncomfortable and itchy. It is not contagious, but people suffering from discoid dermatitis have high chances of developing other kinds of dermatitis. This condition is more common in winter when the humidity levels drop. Nummular eczema is very rare in children and is more common in males between the ages of 60 to 70 years. Around 5.5% of the adult population in the USA suffers from constant eczema problem, which comes to approximately 15 million people. Discoid dermatitis can either be dry or wet. In the dry state, the patches are red scaly and cracked while in the wet condition the patches are in the form of small bumpy fluid-filled sacs which ooze out liquid puss. The wet condition is very itchy, and once the fluid dries, it forms a crust. Usually, at first, the patches are dry but then turn wet and oozy. In some case, it may lead to severe itching, but some people don’t feel it at all. It can also cause a stinging or burning feeling. 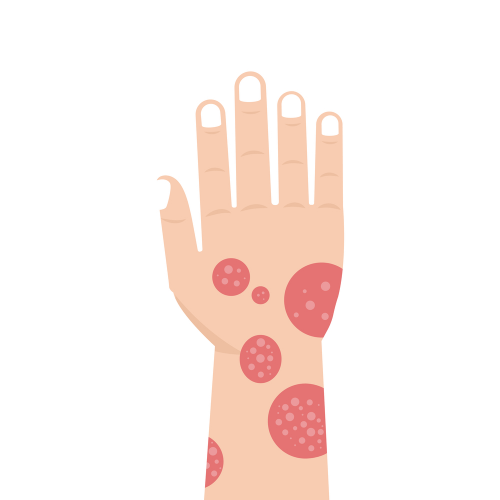 What are the options for treating nummular eczema? There is no specific cure for discoid eczema, but you can focus on the following treatment options like rehydration of the skin, correctly identifying and treating the infection and easing the inflammation. Take a shower in cold water at least twice a day. Then apply moisturizer or medication immediately on the wet skin so that it can easily penetrate. Topical steroid like Corticosteroid reduces inflammation rapidly and should not be applied on the affected area for more than two times a day. If the plaques are scaly and thickened then Tar preparations help in reducing the same. Try to stay in a moist and cool environment; it helps in reducing the symptoms. Phototherapy, i.e. exposing yourself to a controlled quantity of natural sunlight or using artificial UVA or UVD light is considered very effective. Using emollients like bath oil, substitute of soap, ointment, cream or lotion in case of eczema makes the skin smooth and soft. Medication available over-the-counter are also helpful but you have to inform them if you are allergic to anything in particular. Wet wraps are very effective in reducing the inflammation. Alternative treatments like homeopathy, aromatherapy, massage, and certain herbal treatments are considered beneficial. How to reduce the chances of recurrence? Always keep your skin well hydrated by using moisturizers liberally. Using bath oils is also effective. Never take a bath in hot water or use soaps. Wear loosely fitted clothes made of natural fabric. Use a humidifier to increase the humidity of the environment around you. Never scratch the affected area. After a bath do not rub, instead just pat yourself dry. Lastly, follow the recommendations of your doctor carefully. There is no specific and straightforward cure for discoid eczema, but several things can be done to treat and prevent it.